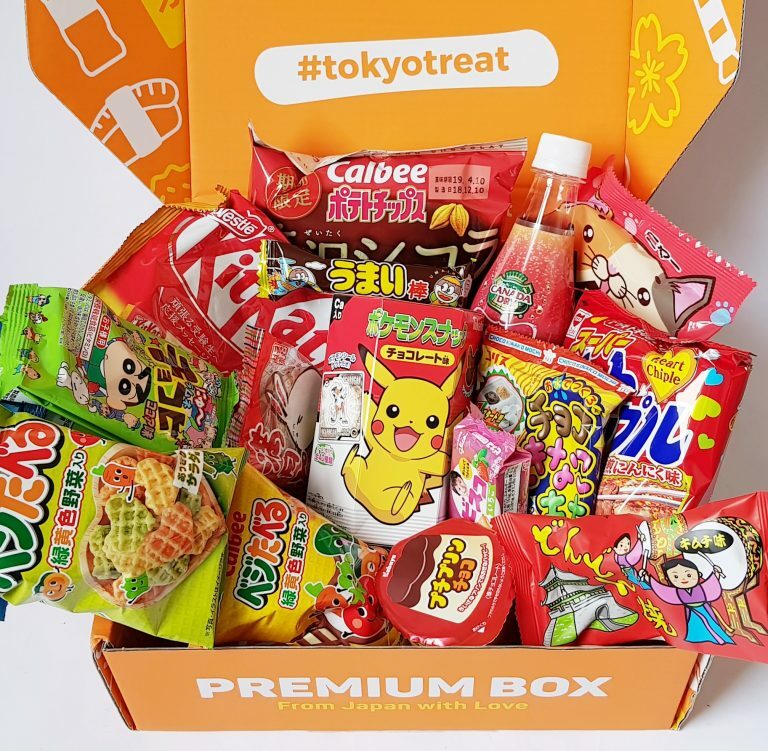 Premium $35 (around £26) per month: 5 popular Japanese snacks, 4 share packs, 3 dagashi, 1 anime snack, 1 DIY candy kit, 1 kinose snack, 1 Japanese drink. 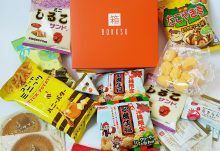 Classic $25 (around £18) per month: 4 popular Japanese snacks, 4 share packs, 2 dagashi, 1 DIY candy kit, 1 kinose snack. This month’s romantic theme is perfect for February: Sweet Valentine! 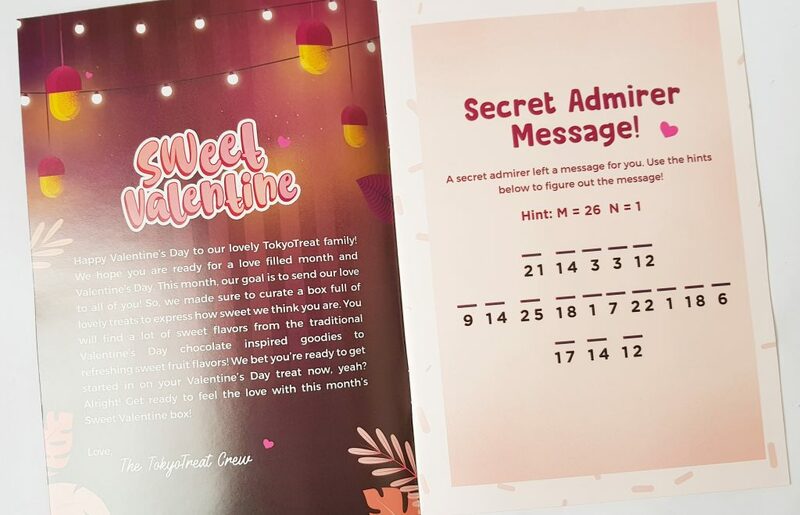 In the menu booklet this month there’s inspiration for some romantic treats, as well as a little code to crack! Here’s the full menu of items. Information on the featured snack, and instructions for the DIY candy kit. 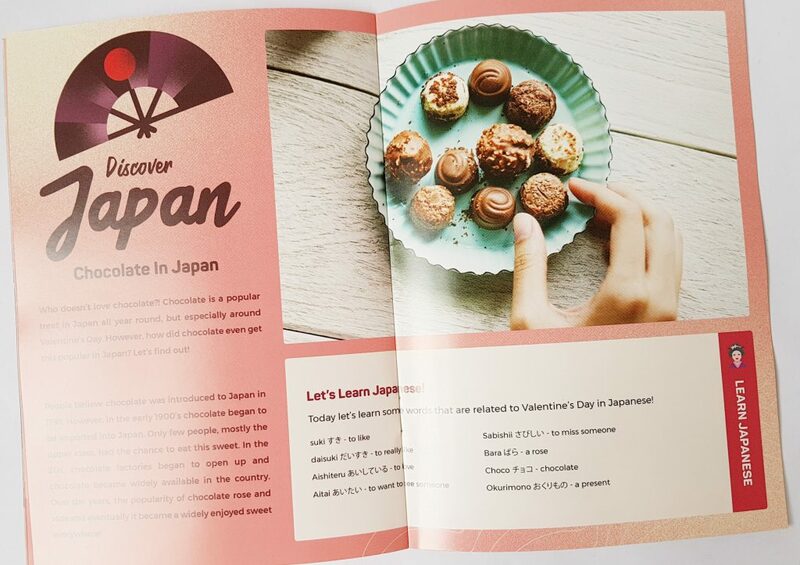 You can even learn something about Japanese culture! 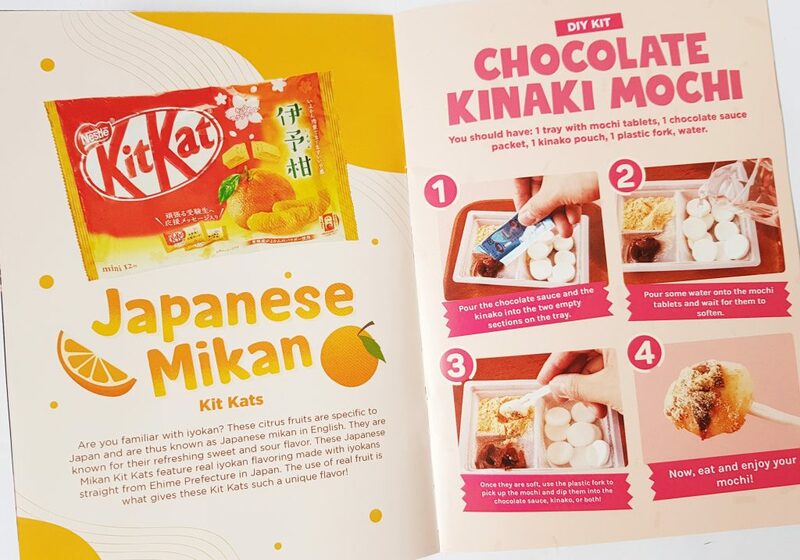 Here is the featured snack, Japanese Mikan KitKats. Mikan is a citrus fruit found only in Japan, and tastes somewhere between a mandarin and a grapefruit. 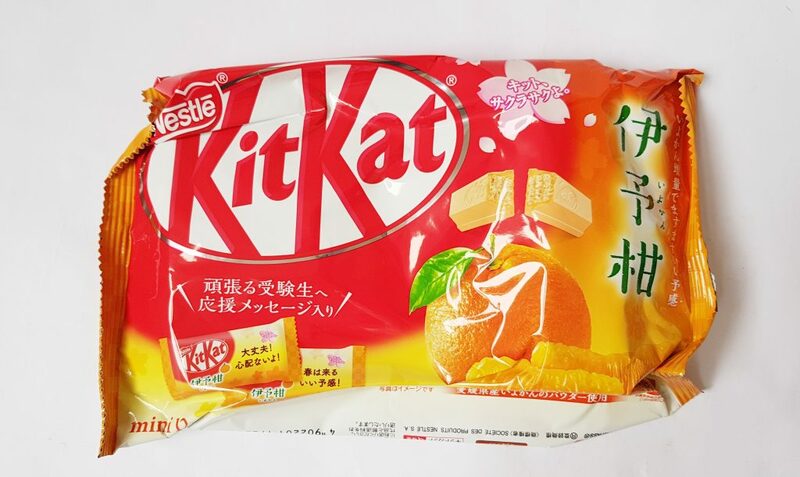 These KitKats are covered with mikan-flavoured white chocolate, so are sweet and delicious. I think this is one of the most unique varieties I’ve ever seen! 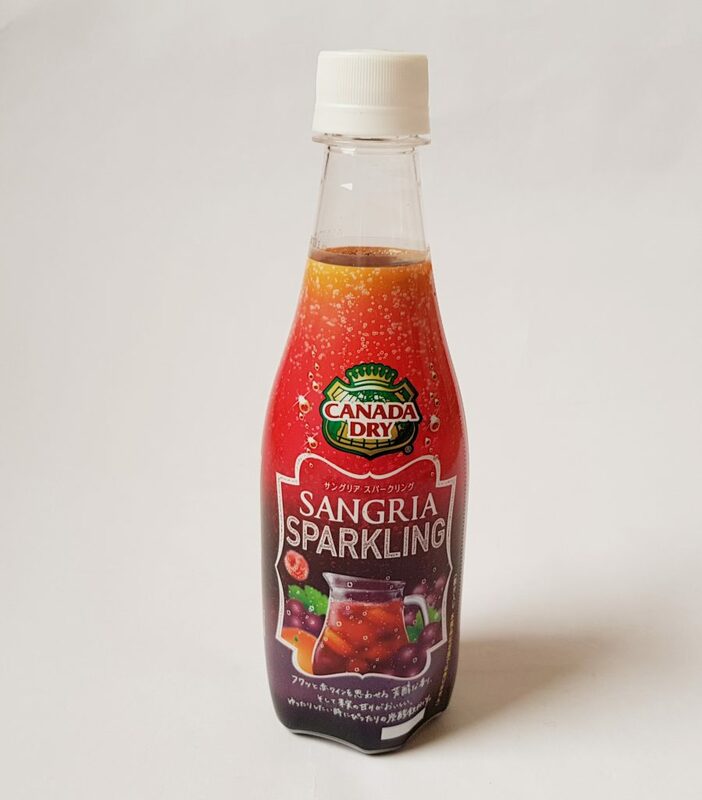 This month’s drink is Canada Dry Sparkling Sangria. While sangria is traditional made with red wine, this nonalcoholic version is made with grape juice instead. 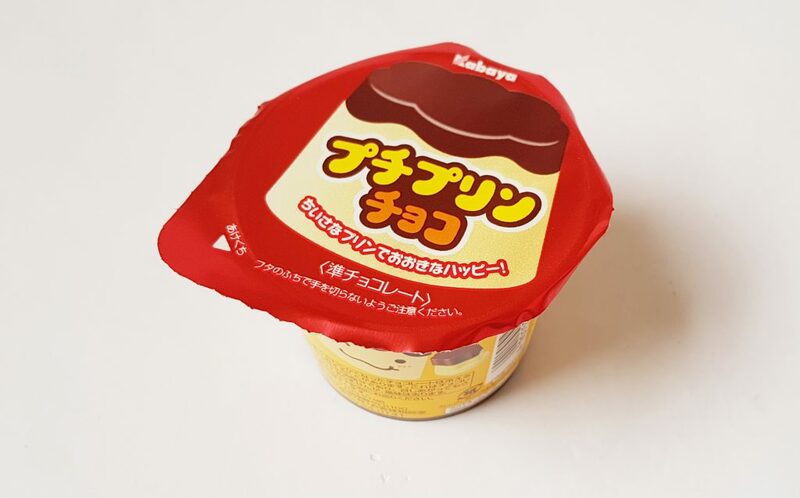 Petite Pudding Chocolate is a little tub of chocolates made to look like pudding, a popular dessert in Japan. They consist of a layer of vanilla pudding chocolate topped with milk chocolate, and are sweet and creamy little mouthfuls. 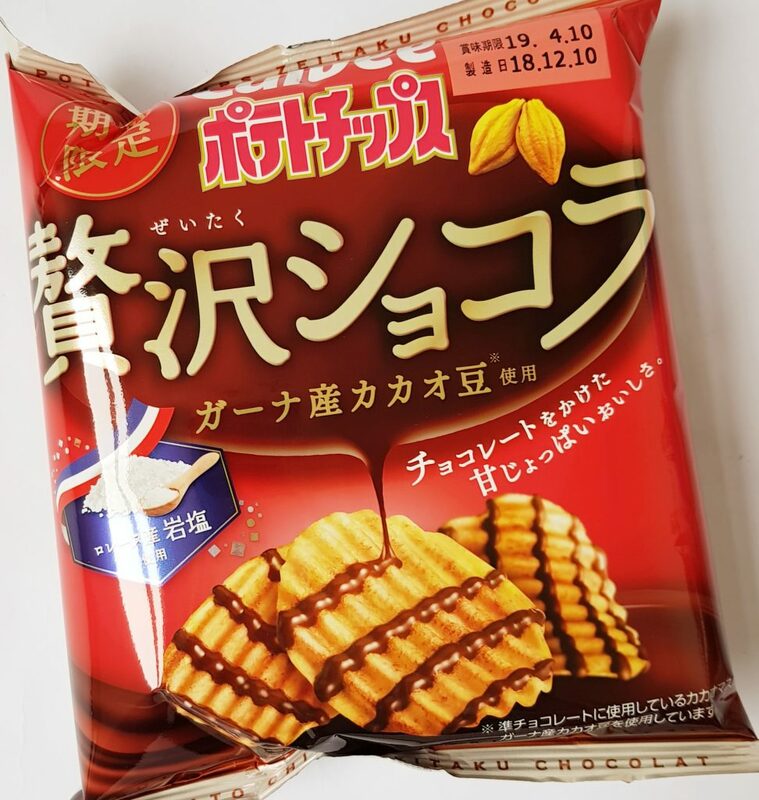 These might look strange, but Calbee Chocolate Dipped Chips are amazing! I love salty and sweet together, so salted crisps with chocolate is my idea of heaven. Salted chocolate is very common now anyway, and the crisps give you an extra interesting texture. 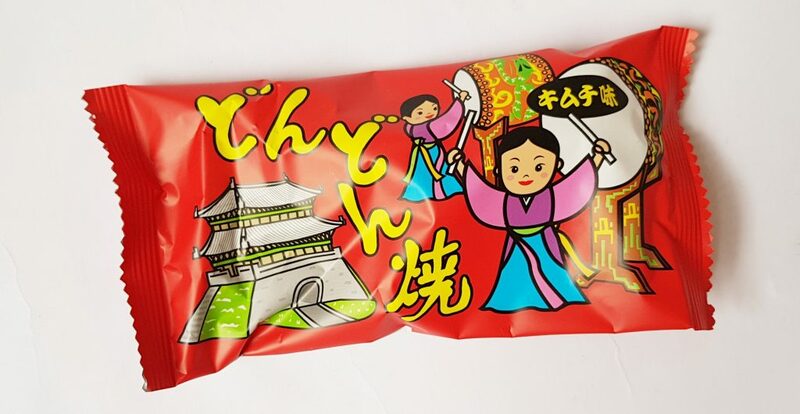 Here we have a little package of Soy Sauce Crackers. Crunchy and savory, they’re a perfect quick snack. 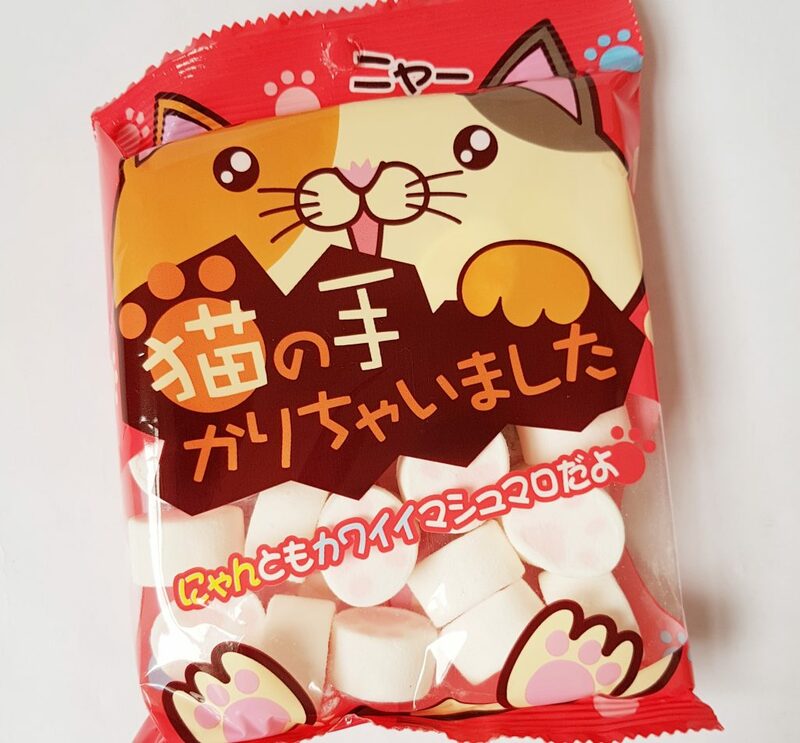 These Cat Paw Marshmallows are very cute! Looking like little cat paws, they’re bite-sized and the bag is big enough to share. 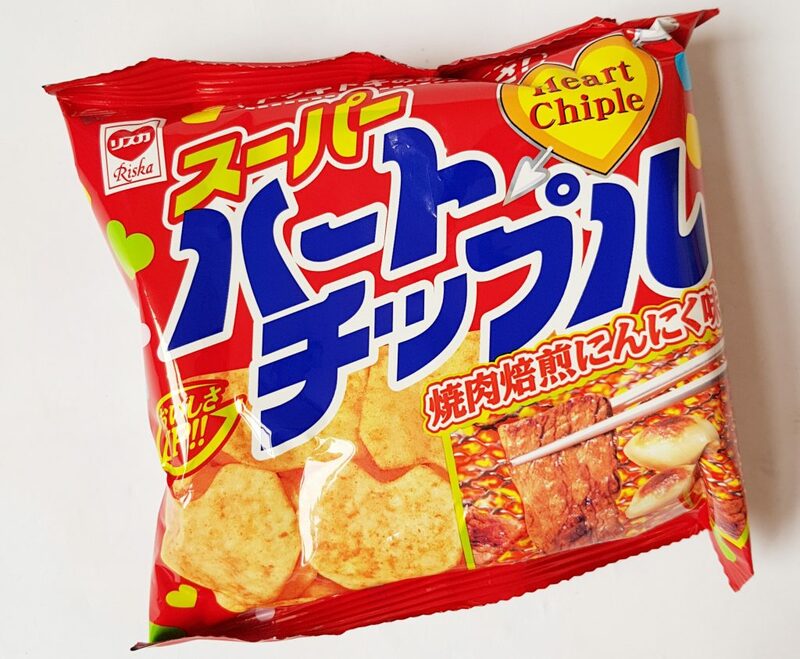 Super Heart Chiple are light rice puffs with a garlicky BBQ seasoning. The garlic flavour is really quite strong, so these are definitely something to share so you both have garlic breath! Also, because I have an allergy I often need to check ingredients for savory foods. The company that makes these, Riska, has a fantastic website where the lists of ingredients are very easy to find. 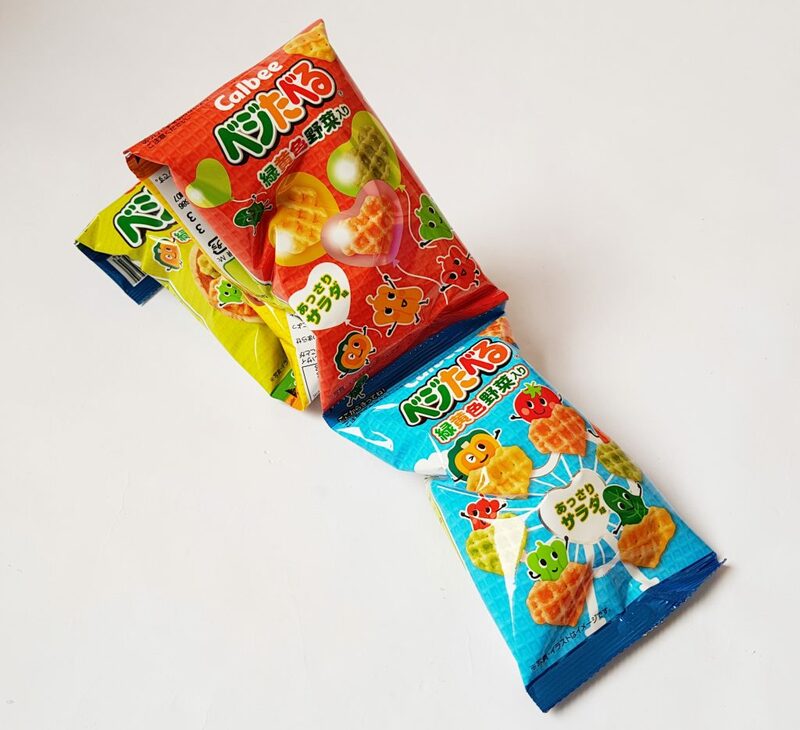 This month’s sharing pack is four little bags of Calbee Vegetable Salad Heart Chips. These are exactly what they sound like, little crispy hearts flavoured with vegetables. Amazingly enough they do contain actual vegetables too! I love ramune candy, which is Japanese soda-flavoured candy. 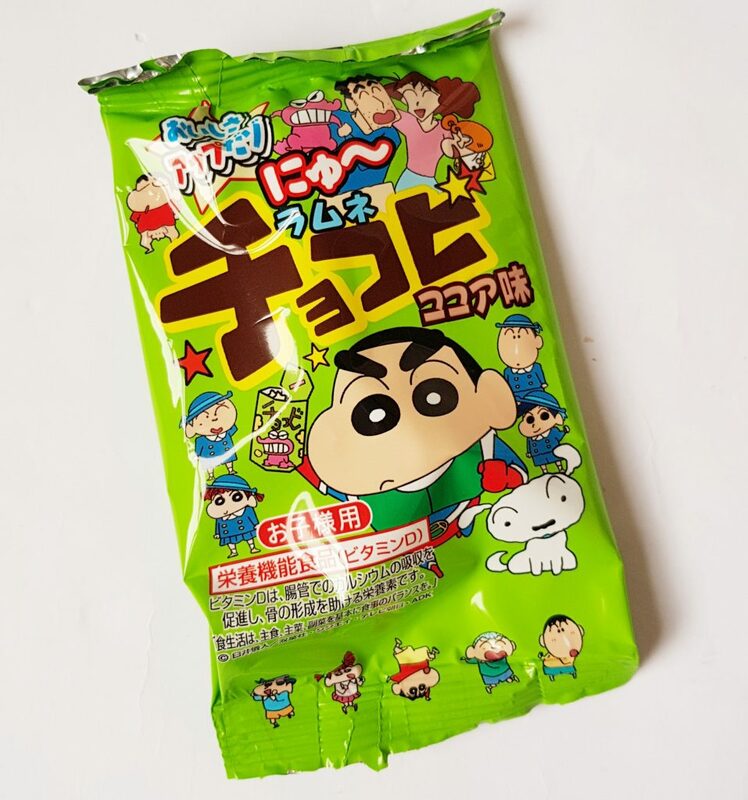 Usually it is some kind of fruit flavour, but Shin Chan Chocolate Stars is unusual in that it is chocolate flavoured! The little candies are individually wrapped, so you don’t have to worry about finishing them all at once. Glico Strawberry Biscuits are a little package of sandwich cookies with strawberry cream inside. They have a nice strawberry flavour and are not excessively sweet, which makes a nice change from your average sandwich cookie! They go very well with a cup of tea. 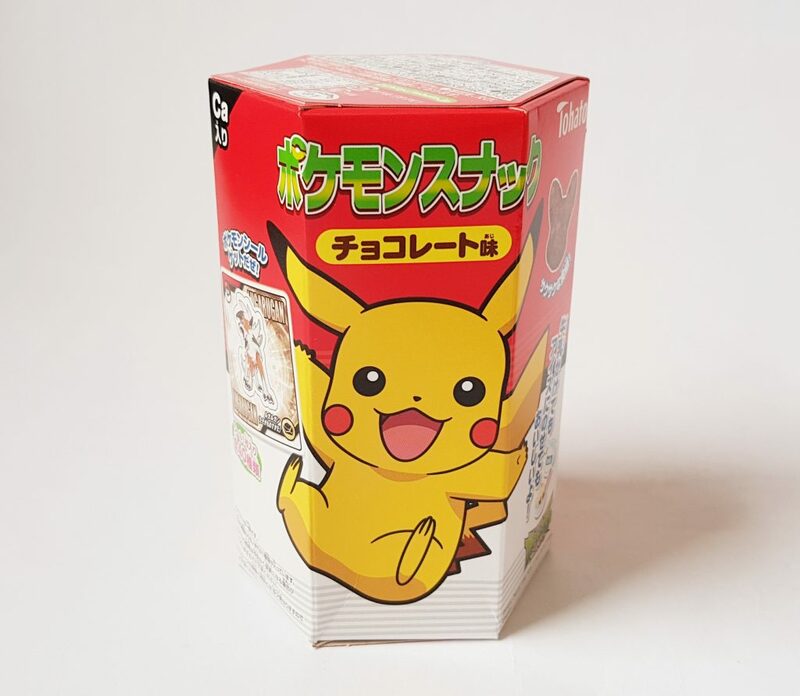 The kawaii snack this month is Pokemon Chocolate Puffs. These little corn puffs are sweet and light, and shaped like Pikachu! There is also a bonus stickers inside the box. 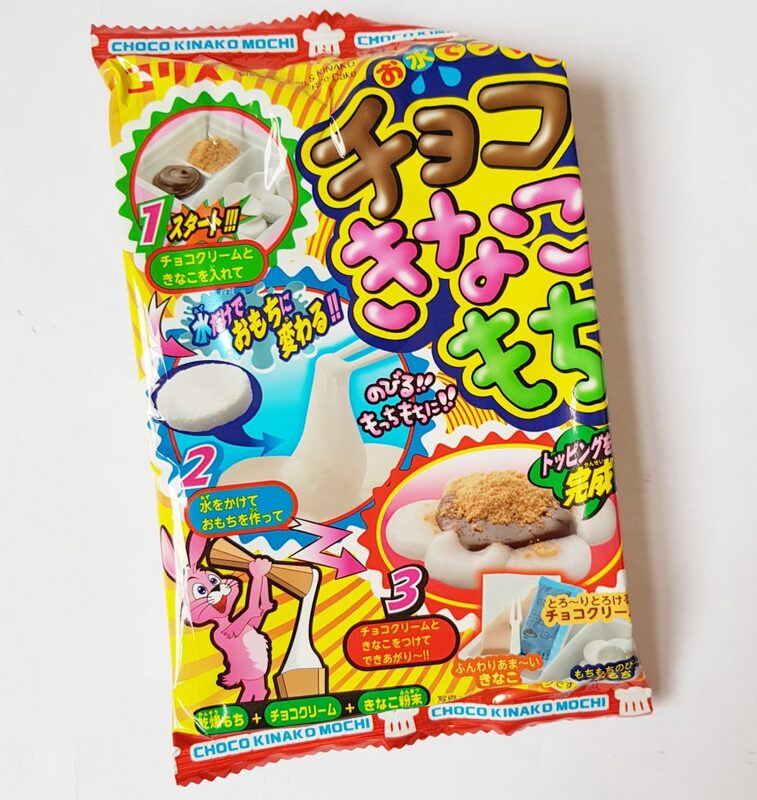 This month’s DIY Candy Kit is Chocolate Kinako Mochi DIY Kit. It consists of tiny mochi (soft rice cakes) with chocolate sauce and kinako powder to dip them in. 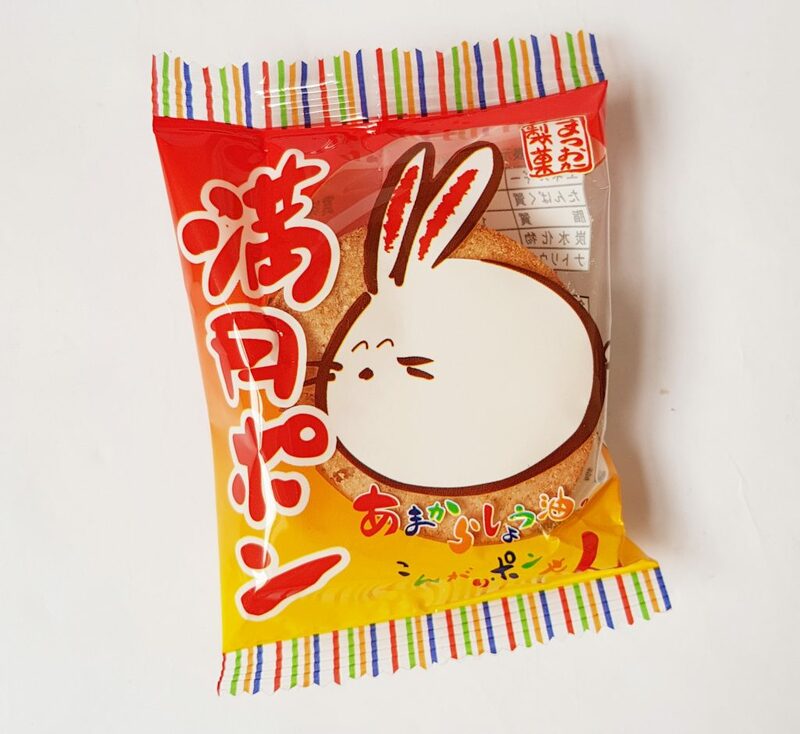 Kinako is roasted soy bean powder and is kind of sweet and savory at the same time. 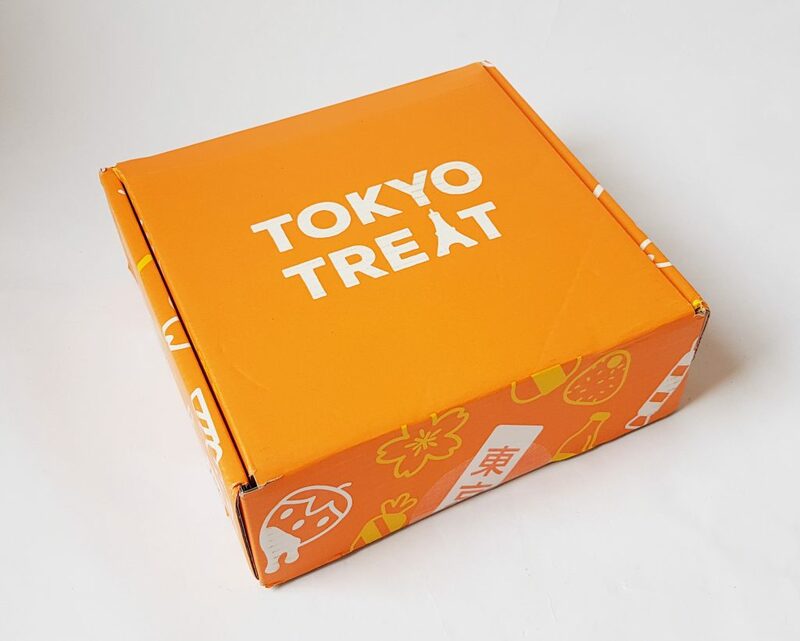 It’s one of my favourite Japanese flavours, so I’m really looking forward to this! We’ve got a sweet Chocolate Umaibo this month! 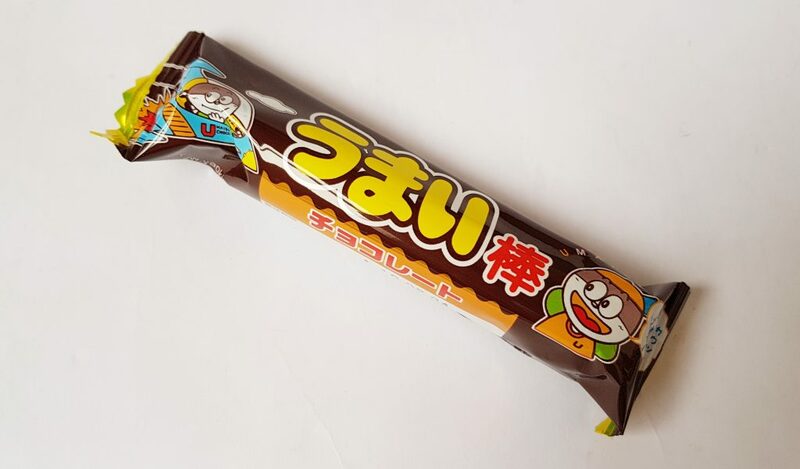 Usually Umaibo (a puffed cord tube) are savory, but this version has been soaked in chocolate so it’s light a rich at the same time. Yum! Finally, a little pack of Kimchi Rice Puffs. Kimchi is a Korean staple, but it’s also extremely popular in Japan. I’ve not actually tried these as kimchi generally contains seafood, but anyone who likes umami flavours will enjoy this! 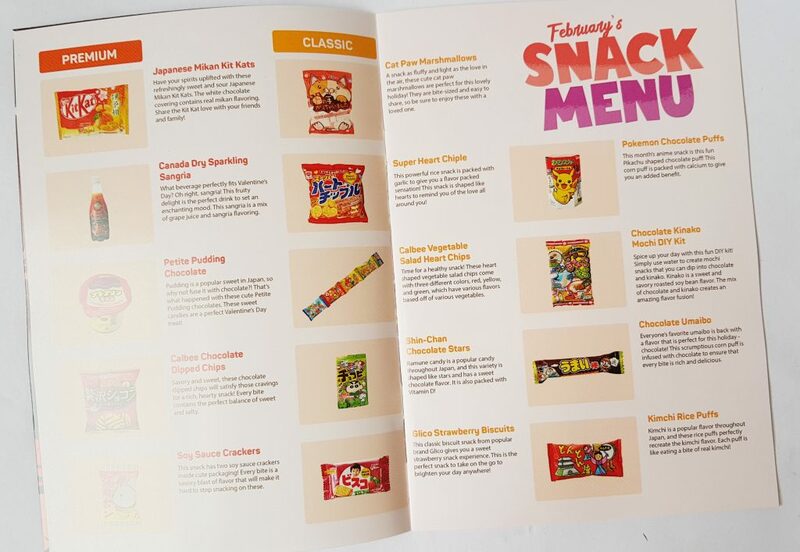 I think the chocolate crisps are my favourite this month, though the KitKats are also fantastic, and of course the Umaibo. 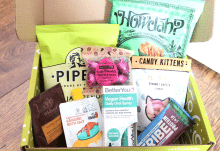 One of the best things about this box is the sheer variety of flavours you experience, which you are unlikely to see anywhere else! 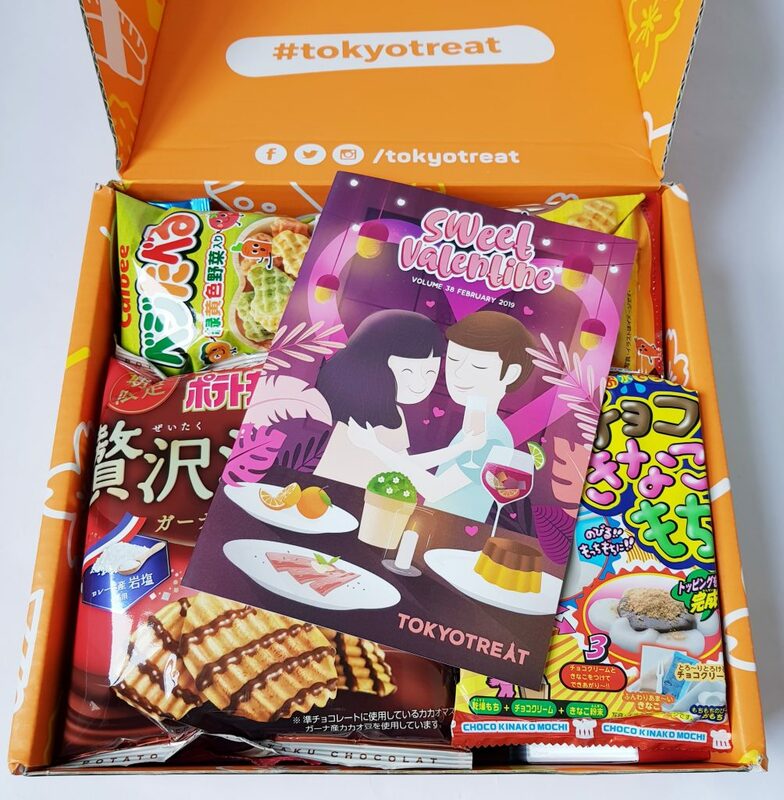 TokyoTreat has done a great job this month with finding fun snacks with a romantic twists, especially the heart shapes! The garlic rice crisps are actually delicious, just make sure you have some mints for afterwards! A lovely selection of flavours and textures, including a couple of things that are completely new to me! This could even be a romantic gift for the foodie in your life.